Garvan's breast cancer unit, led by Dr Samatha Oakes (pictured), will benefit from the processing power provided by Australia's smartphones. DreamLab – the brainchild of The Garvan Institute for Medical Research and Vodafone Foundation – pools the processing power of Australia’s mobile devices to solve cancer research problems. The power of each individual’s smartphone is used while they are sleeping. The app was built by b2cloud. When a smartphone is plugged in and fully charged, the DreamLab app automatically downloads a research problem and sends the result back to Garvin researchers – via the Amazon cloud – like a giant crossword puzzle with each user solving a different clue. 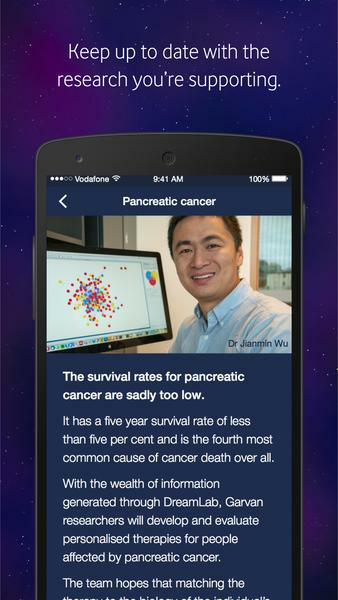 Garvan said the app has the potential to greatly speed up cancer research. With 100,000 smartphone users on board, researchers will be able to crunch data about 3,000 times faster than the current rate. With 5 million users, that increases to 150,000 times faster than the current rate. For its part, Vodafone is offering its 5 million prepaid and postpaid customers free data usage when using DreamLab on its network across Australia. The program has a specific focus on research efforts to find cures for some of Australia’s biggest killers – breast, ovarian, prostate, and pancreatic cancer. One of the research teams set to benefit from DreamLab is the breast cancer unit at the Garvin Institute of Medical Research, led by Dr. Samantha Oakes. Dr Oakes is urging Australians with Android smartphones to download the app. She was 6 years old when her brother was suspected of having bone cancer so she understands the toll the disease takes on patients, their family and friends. “The worst thing for those touched by cancer is fear, the fear of the unknown and of what’s to come,” Dr Oakes said. DreamLab users can nominate how much data they want to contribute – 50MB, 250MB or 500MB a month – through the mobile network they are using, or home WiFi network (250MB, 500MB or 1GB). DreamLab won't drain the phone’s battery or access private information on the device. The app is free from the Google Play Store for all Australian Android users.